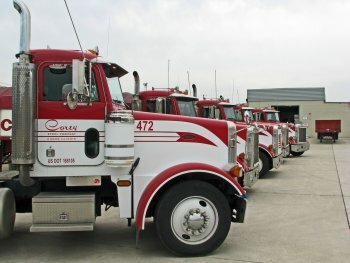 For deliveries within a 250 mile radius, Corey Steel is able to perform prompt and cost effective delivery with our own in-house fleet of tractors and trailers. Having our own private, contemporary and well maintained fleet gives us the ability to provide our customers with unmatched reliability and control over each shipment. Our ratio of trailers to tractors allows us to load Corey trailers at all times of the day … an important efficiency to getting material to our customers when they need it. You will find our experienced drivers courteous and eager to meet your service needs. Do you have a question regarding your shipment? Our Corey driver is happy to help. Using the talents and capabilities of our Traffic Department staff, Corey will make all the necessary arrangements for the shipment of your material beyond our local area. Corey works very hard to develop and maintain valuable relationships with approved carriers for both on the road and inter-modal shipments. We commission only those carriers that have proven track records for on time delivery at competitive rates. Many of these common carriers deliver full truckload, less than truckload, and pooled truckloads. No matter what the size of your order, Corey works diligently to find the most cost effective method for delivery. Do you prefer to make your own pick-up arrangements and/or send in your own equipment? Our courteous, helpful staff is happy to assist with details such as directions, load information or to advise when a load is ready for pickup. Drivers are encouraged to call ahead to allow us time to ensure your load is prepared upon arrival.